Salute to Old Timer's Ingenuity - Jill Ruth & Co.
Sweetness! I went to an auction yesterday and was pretty happy with a couple of the things I brought home. This table is quite sturdy and bonus! 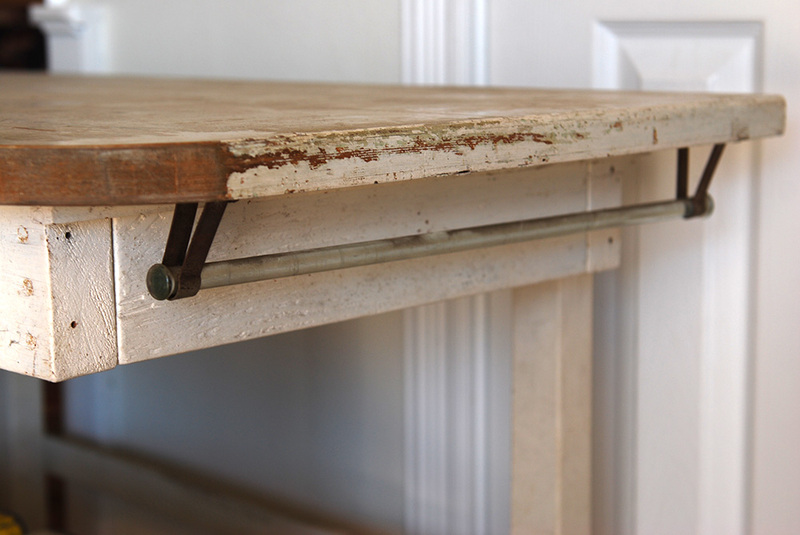 has a towel bar attached to it that I didn't even see when I bid on it. I know, so much for close inspection. :) Which is why I came home with this a few weeks ago. 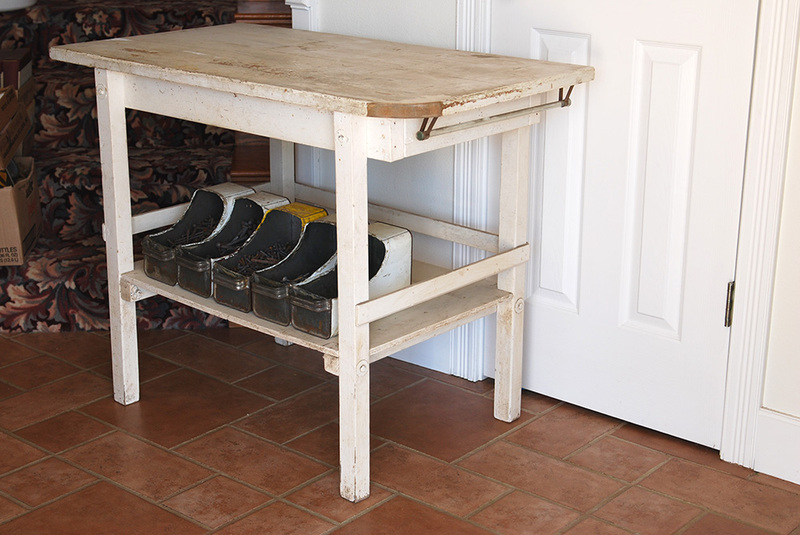 But, per your advice on that conundrum I am going to marry the cubbyhole piece to this table. So's the plan, anyway. 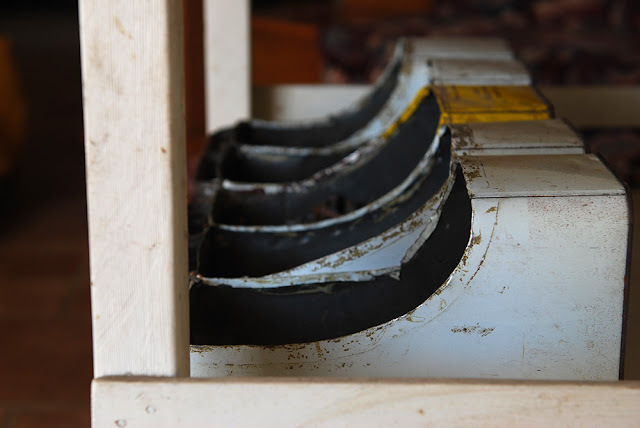 A big **SALute** goes out to the man who cut out these tin gallon cans to make his own drawers/bins. A woman could have made these, Rosie the Riveter comes to mind since they are full of rivets! I just love these cans. I bought four of them and then had to let two go because the contents brought too much money. But, I knew the one regular auction goer who bought one of them and asked him if he'd sell me the container. He says, "You want the container?!" "You can just have it." I grinned big. The other fella who bought the sixth one...well, not too approachable. These will probably end up in the barn at the work table doing just what they do best, holding screws, bolts, washers, etc. The edges are a bit rough, but isn't the idea great? Do you think there would be any danger of a spark when you'd take a tin snip to these.? These gallon containers seem to be the ones filled with flammable contents. I think a person would want to really wash them out even before you started cutting. Then wash again. A grinder could sure smooth up the edges. 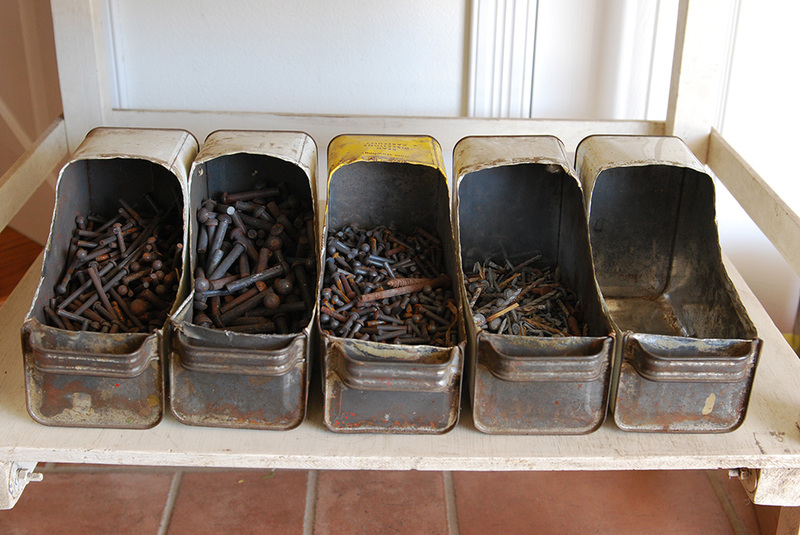 Now, what to do with all of these rivets?! I'm open to suggestions! The farm's grain truck burned up last week just shortly after my husband parked it.I'll post a picture later this week of it. We are thanking God that it wasn't worse. Just the cab is gone and explosions were avoided! I'm linking up with Apron Thrift Girl and Thrift Share Monday. What a fabulous find, I would leave the table as is but I like that chippy look. Love the table and the towel bar, but the cut out cans are the best! It's so funny to see guys reactions to our likes. Jill! that white table will be perfect as the island in our kitchen! it was so nice of you to pick it up for us. oh...wha...not in your plans? ok then. those cut cans are really great. it is exactly what my grandpa would have made. and he would have loved telling all us g'kids how he did it and how grandma tsk tsked the whole time. brent saw you (and said hi by the concession stand) but figured you were in 'auction mode' --and I assured him, you, like me, get in the mode and there is no jolting us out of it til we're ready. I love the towel bar on that table. 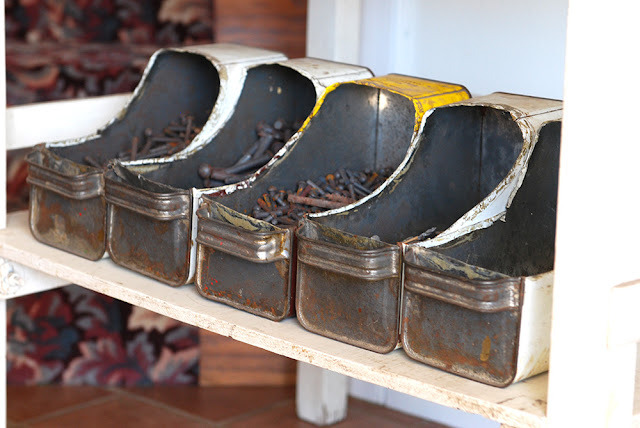 And those old metal containers - recycling and reusing at its best - when it was a necessity not a fad. Sorry to hear about the grain truck but so glad no one was hurt. you find the best stuff...love the table...but the metal containers are the best...congrats on your finds! Yikes the grain truck in flames...sounds frightening and most alarming! The table is super AND those can bins are just too fabulous...bet you're glad you asked the one fella about his...terrible to think of anyone just throwing one away...ooo hurt to type that! And, I Found This Too.